The idea of being a performance consultant started over two year ago. I knew that I wanted to help other musicians develop original music and hone their live performances. An aspiring musician or even a gigging musician can always use another set of ears. Even more importantly, a songwriter or performer needs support. In my own personal pursuit of great songwriting and performance I’ve often felt the need for a consult. I knew that being there to fill that void for someone else would prove valuable. I began working with a young man named Coby Mandell. Coby was already a great performer and singer, but with room to improve. Coby and his parents wanted songwriting and performance consultation. My role was to support and guide him through the songwriting process and to help him hone his stage identity. After a time working with Coby, his performances improved considerably. Within the past year Coby has formed a band called The Royal Pains. The band is made up of Coby’s Sister, Carly Mandell, Jed Alpert on bass, and Ty Schwarzer on drum kit, and I have continued my role as performance consultant, but for the band as a whole. 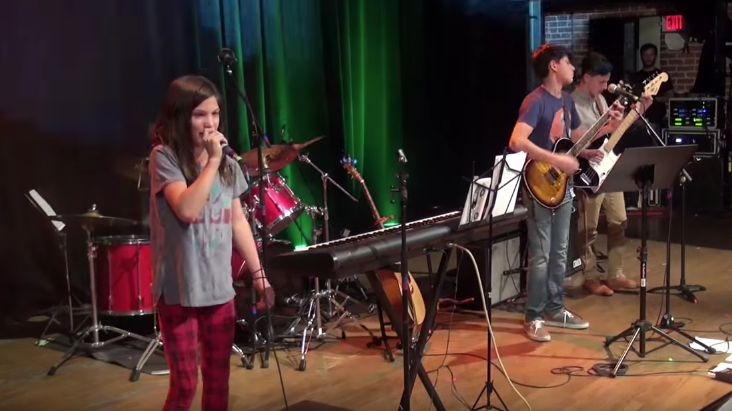 In October of 2015 The Royal Pains performed at The Boulder Theater for Techstars Founder Con. The group performed a wide array of material from grunge to folk. The performance was a great success for the kids, but the song that stole the show was their original arrangement the The Civil Wars song “Barton Hollow.” This song was arranged with just Guitar and vocals initially, but in order for “Barton Hollow” to fit The Royal Pains, we had to write a Bass part and Drum Kit part. The kids were playing parts for this song that we’re all their own and the result was a fantastic performance. I was in the crowd the Boulder Theater being a fan. Coby and Jed were sporting their best rock power stance, Carly was smiling and lighting up the room, and Ty was banging his drums with furious conviction. It’s was a special moment to realize you would be able to soon follow your student’s band on Spotify. The Royals Pains are continuing the pursuit of more great performance as well as rock super stardom. You can catch them performing in Boulder in the near future. Wherever they play, you can recognize them as the band with the big crowd. If you or someone you know would like a consultation regarding my services, please contact me at Colkel1124@gmail.com.